The key to personalizing your wedding table design and making your wedding different from any other, is to select colors and details that reflect your personal style and taste. Details such as color and tabletop design should be well thought out and tie together in a way that is both meaningful and beautiful. Our team has the creativity and experience to help you put your signature style on every detail of your wedding. We encourage couples to have their color palette in mind before they start the venue selection process. This approach helps you immediately eliminate venues that will clash with your vision. If you are like many of our couples, you’ve already selected a venue by the time you book our services. When that happens, we’ll help you find a spark of inspiration from the canvas that you provide. We’ll help you fine-tune your textures, tones and hues until we have a work of art that you will treasure for years to come. One of the benefits of hiring an experienced wedding florist are the resources they have available at their fingertips. Before you begin searching for tabletop flair, save yourself time and potentially money by checking your wedding florist’s inventory. 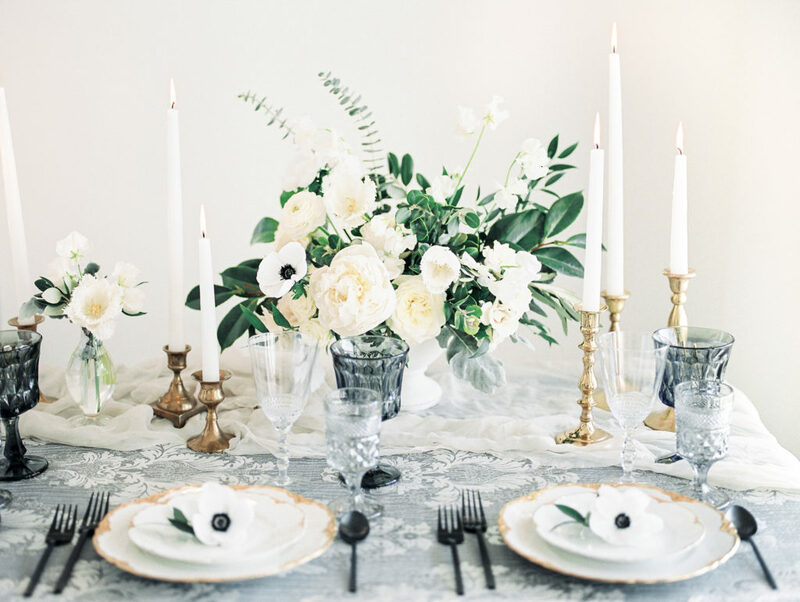 At Nickie Jones Events, we have an extensive collection of linens, chargers, vintage décor and select furniture for a variety of styles and budget. For example, if you absolutely fell in love with the Baccarat candelabra, our signature décor line includes a gorgeous 30” tall crystal candelabra for less than you’d pay on your own. When you become our client, you gain access to our inventory closet and our couples love it! The existing design of your venue will set the stage for how far you take your creative ingenuity. Do you have a blank room that will need extensive embellishing or is it already adorned with intricate ceilings and rich wood interiors? If the ceiling is dripping with gorgeous chandeliers or draped in lush fabric, adding too much detail to the tabletops might clash or compete with the existing design of the room. An outdoor garden setting may already provide plenty of flowers and greenery, eliminating the need to invest in more elaborate floral arrangements. If your reception is held in the evening, nothing adds to the romantic ambiance than candles and soft lighting. A daytime wedding in a bright space is the perfect setting for a fun and colorful arrangement. The biggest pitfall in tabletop design is when you don’t view the room as whole and focus solely on the individual table. Scale is an important aspect of the entire design. Take a long view of the room to find the best visual impact. If the room is large and plain, tall arrangements on each table will create a dramatic pop to the décor. If the room is small, oversized arrangements will make the space seem crowded. If you are using banquet seating, a collection of similar objects can make a strong impact. You can use small vases spaced evenly down the table or a series of candles or decorative touches. A large round 72” table is best accentuated with a larger tabletop display. A high-top table is easily polished with a single votive candle or a floating flower. Consider using either a low centerpiece or one that is taller than your guests’ heads when seated so, they can easily talk to the person sitting across from them. Gorgeous, quality linens and place settings can create a breathtaking table at your reception. At Nickie Jones Events, we have a beautiful selection of designer linens and will help you select an option that best compliments the look and feel of your wedding. From table runners, patterned table cloths and embellished napkins, don’t underestimate the creative possibilities of linens, chargers and flatware. To fill a large vase, consider using a floating candle or single flower stems for an understated but elegant look. Tree branches can go a long way in making a dramatic statement. While adding hanging votives will create ambiance, it will also increase your cost. We enjoy dreaming up creative ideas to add glamour to the seemingly unglamorous. It’s fun to do the unexpected and add your own personal spin to the traditional floral tabletop designs. Add a pop of color with various size jars of bright candy. Use photos of parents and grandparents on their wedding day to create a personal touch. Nickie Jones Events has a stock of assorted vintage and modern frames to keep the look consistent. Feathers are not only economical but create a dramatic flair for a tall arrangement. Fruit can be used not only as a vase filler, but as the arrangement itself. Candles come in various colors, widths and heights providing numerous possibilities from decorative lanterns to floating candle displays. Even a grouping of simple votive candles can create a visual wow! With so many options, you can easily create a stunning tabletop design within a variety of design budgets. Keep in mind, however, that the most beautiful aspect of your tables are the friends and family who will fill the seats to celebrate your special day! A posh and pretty party is only a click away – visit our weddings page to get started. Copyright 2018, All Rights Reserved. We love to share, and ask that if you would like to use the content on our blog, please provide the appropriate credit to Nickie Jones Events, LLC. Nichole Anderson is the Owner and Senior Designer of Nickie Jones Events, LLC. 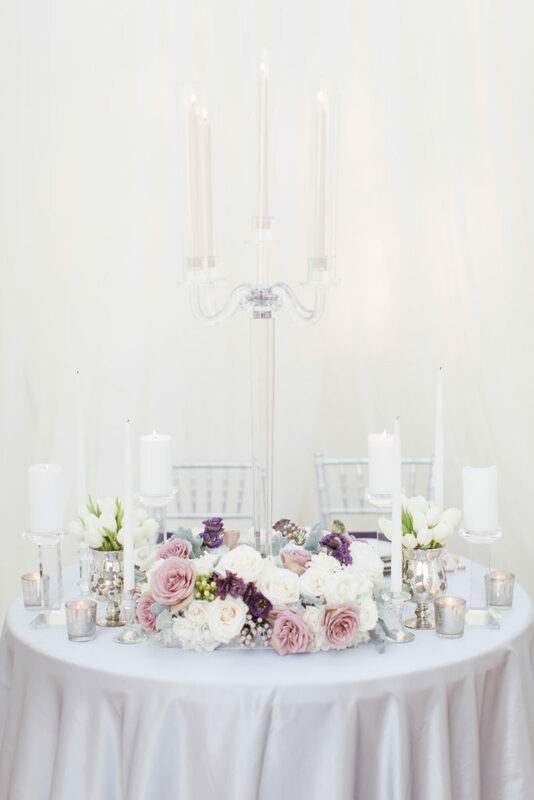 Nickie Jones Events, is an award winning New York, New Jersey metro area floral design and event production studio, specializing in meticulous design, exceptional creativity, and flawless execution.